Hello! My name is Daniella, I’m 24 years old, currently I’m living in Stamford, CT (close to downtown) and now I’m looking for a Babysitter/nanny position. 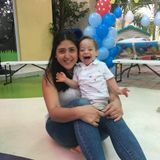 I have a lot of experience with kids, months ago I finished my aupair program working during 2 years for an amazing american family in White Plains, NY. I worked in a daycare on my country and in a kindergarten teaching English.I’m infant qualified, I have experience with kids from 3 months old to 14 years old, I speak Spanish and I’m fluent in English, I’m a good cooker, good making crafts and I enjoy outdoors activities. I consider myself responsible, flexible, creative, energetic, mature and VERY patient. I can give references about my previous jobs, feel free to ask me whatever you want to know about me and my experience, have a good day!